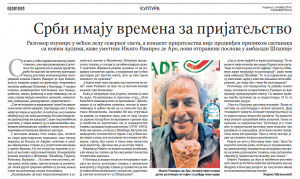 I was recently interviewed for Politika Daily in Belgrade. I was thrilled they asked me for some issues that are present both in Serbia and Spain. From my point of view, conversation is the basis for new projects, friendship and creation, the essence of living.